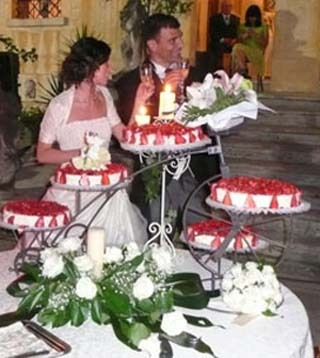 The tradition of a wedding cake can be traced back to ancient times. In Rome, the groom would eat a piece of barley bread and then break the remaining bread over the bride’s head, allowing the crumbs to fall upon her. This custom was thought to bring the bride and groom a fertile and fulfilling life. Customs have evolved over time, and today the romantic confectioner's delight serves as a decoration and dessert. The bridal dessert symbolizes the happiness of the couple and filling the bride and groom with food for their future lives together. The size of your confectioner's creation is important, so when thinking about your wedding cake ideas, remember to choose the right size which is usually dependent upon the number of guests that will be served. One 20" = 120 slices. One 18" = 140 slices. 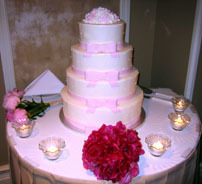 Determine the size of the layers that will be needed to provide each guest with a decent size piece of cake. Order a slightly larger cake than you think you will need so that you don't run the risk of not having enough dessert for all of your guests. 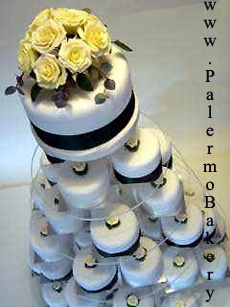 It is important to put your order in with a baker about two months ahead of your wedding date. Wedding Cakes For You Award Winning Pastry Chef Lorelie Carvey shares her secrets to create a beautiful wedding cake. 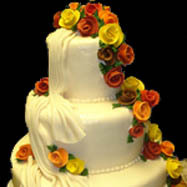 This is a great site for brides to be and cake decorators alike! There are many choices of frosting some of which are: vanilla cream, chocolate, strawberry, lime, cannoli, lemon, raspberry, and blackberry. Most brides want to be unique, however, it is a good idea to choose a filling that the majority of your guests will enjoy. Your bridal cake should include: garnishes, toppers and whatever decorations you choose, all of which will add to its beauty. You can choose a flat, single sheet or tier style as this beautiful one shown below. Its simplicity and elegance will delight your guests. If you would like your guests to enjoy their own individual cupcake they can revel in these cupcakes arranged in a tower creating this very special bridal cake. Many couples are looking for something different so you can choose; heart, round, square or oval pan shapes. Unless you are fortunate enough to have a baker as a friend or family member, you will need to obtain some recommendations of bakers from friends, family members or your caterer. Most bakers are busy and it’s a good idea to make an appointment rather than just showing up at their shop. It’s perfectly acceptable to ask to see pictures of their work and ask for a cake sampling. White is the traditional bridal cake color, however, if you want to add some color to your masterpiece, bring your color palate along with you when interviewing prospective bakers. For more unique wedding cakes see this website. Your baker will help you select the flavor, filling and icing choices. If you have any special wishes, or ideas, discuss them with your baker so they can plan accordingly. If you are providing your own topper bring the topper to your baker ahead of time so the baker can determine the size and weight of the topper and how it will affect the balance of the cake. Know the number of guests that you would like your dessert to serve and ask the baker the price, including the delivery charge. 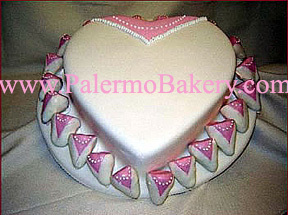 Discuss the time that you want your cake delivered and give the baker the exact location and a contact phone number. Think ahead to your first anniversary and ask your baker if they can make a small sample dessert for you to freeze and eat while celebrating your first anniversary. 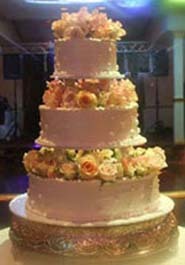 It is important to have a written contract with your baker, which includes, the price, size, shape (if possible a picture of the cake that you agreed upon) time of delivery, destination, contact phone number, and any other verbal discussions you have agreed upon. You want your cake to be both yummy and beautiful so all your guests can enjoy eating and admiring your delicious creation. 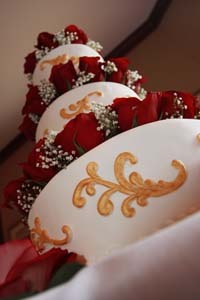 The sky's the limit when you are creating and designing your wedding cake. Use your imagination and have some fun turning your thoughts into a really beautiful confectioner's delight. You've had many ideas since you were a little girl dressing up, with a "veil" and a bunch of flowers. Now, the make believe is for real and it's time to put some of those ideas into a plan. 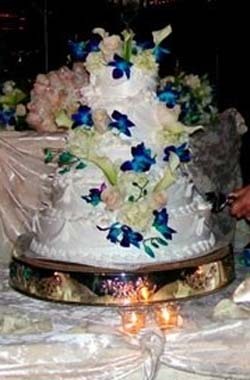 Your confectioners delight plays an important role in your reception, so I do hope my wedding cake ideas help you obtain the cake of your dreams. 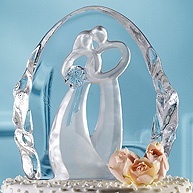 Visit BrideCraft for FREE wedding craft tutorials, wedding advice, creative ideas and MORE!.